If you are sending a gift, and have chosen a selection of products, why not present them in one of our smart giftboxes. Click here to add to your order. 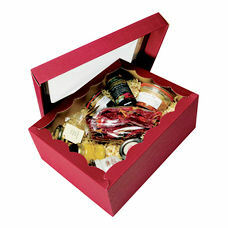 If you have chosen a Hampers or Gift Parcel, they are presented in smart presentation boxes with robust transit outers to ensure your goods will arrive in the best possible presentation and condition. All our Cheese Hampers and Giftboxes are packed for transit. Ice pack/s are added to keep the cheese nice and cool. We do put the ice pack in a plastic bag, to keep moisture away from the rest of the packaging, and we do use special chillpack envelopes where needed. All Cheeses that you have selected, are wrapped as appropriate and packed, with Icepacks, into suitable sized boxes. Any cut cheese is wrapped in Cheese and Wine Shop special waxed paper, and each Cheese is labeled. Where possible, we use recycled transit packaging to keep the cost and environmental footprint at a minimum. For larger orders, we use insulated boxes. These help keep everything nice and cool. Please do use them again if possible, otherwise please recycle them. Cheeses, Smoked Salmon, Clotted Cream, Pork Pies and any chilled items are packed in suitable boxes, recycled where appropriate. Ice pack/s are added to keep the goods nice and cool. They are then placed into suitable transit boxes, with adequate packing to prevent damage in transit. These items are carefully packaged and dispatched in standard boxes, recycled where possible to ensure our, and your environmental footprint is as small as possible. Sending gifts? If you would like your goods to be presented in some of our gift boxes, please see our selection here when ordering. If you choose some Cheese, along with some grocery lines and 2 bottles of wine, and you haven`t chosen a Gift box, then all items will be wrapped for transit, and the Cheeses, which require chilled transport, will be "ice packed". Your combined order of chilled and non chilled items will be packed in one box, utilising foodsafe packing, recycled where possible. Buying as a gift? Then choose one of our smart presentation boxes; click here to see the range. Plenty of Hampers and Parcels from The Cheese and Wine Shop!